The Carbon Ultralite Tubeless Tire Repair Kit from Dynaplug is an easy-to-use, non-messy tubeless tire repair kit designed for use on bikes and off-road vehicles like ATVs, motorcycles, and garden tractors with tires between 3/16" and 1-1/8" thick. The tool body is extremely rigid and strong, made of glass-filled nylon, yet lightweight at only 1.2oz. The insertion tube and seals are stored inside the tool body, secured by the push-on silicone cap. 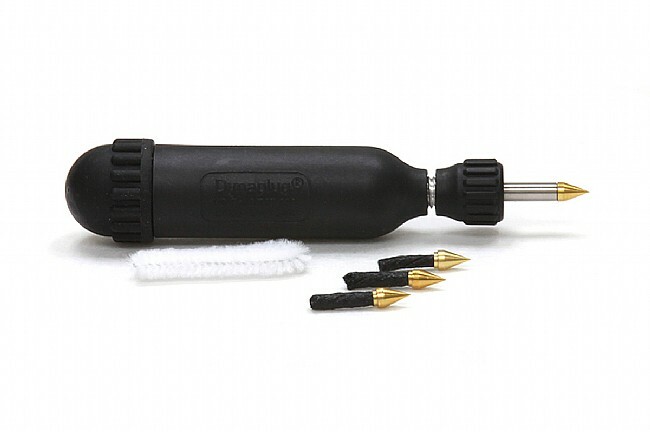 The Carbon Ultralite Tubeless Tire Repair Kit kit includes 1x Dynaplug® Carbon Ultralite, 3x tubeless tire repair plugs, 1x insertion tube, and 1x pipe cleaner. Glass-filled nylon body tool w/ 6061 aluminum threaded insert & silicone cap. Insertion tube and seals are stored inside tool body. Hardened 305 stainless steel insertion tube. Viscoelastic impregnated rubber plug w/ nonabrasive brass tip. Tool Dimensions: 5.42 x .875”. When I had a puncture it came time to dig this tool out of my bag. When I found it the cap had come off the handle and the plugs which I expected were in the handle were now loose in the bag with a few other tools. Once I found the rubber sticky plugs and pealed them off some other items they were ready for use. For bikepacking this is not the tool. Something smaller and able to keep the plugs contained would be in order.